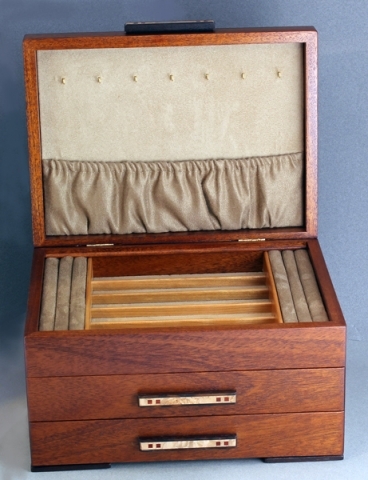 Heartwood Creations by Mike Fisher - The Gingko Leaves 2 Drawer Jewelry Box is skillfully crafted from Sapele (a West African Mahogany) and trimmed with Wenge. 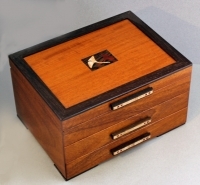 The box top is embellished with a Ginko Leaf inlay design of Lace Wood and Blood Wood. Pearl-Colored Interior and jewelry Inserts are standard. Size is 7" high x 12" wide x 9" deep. Strong and simple lines depict the utilitarian, timeless design of the Arts & Crafts movement. The Gingko Leaf is a favorite motif from this era and represents strength and longevity.